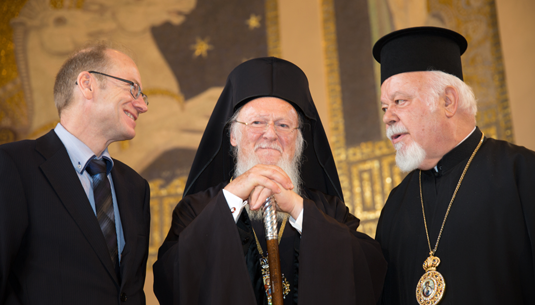 The Faculty of Catholic Theology at LMU has conferred the degree of Doctor of Theology honoris causa on the Ecumenical Patriarch of Constantinople, Bartholomaios I. The Faculty of Catholic Theology at LMU has conferred an honorary doctorate in theology on His All-Holiness Bartholomaios I, the Ecumenical Patriarch of Constantinople. “In so doing, we honor an outstanding personality who enjoys the respect of all denominations of Christianity, and we salute his unstinting commitment to the cause of ecumenism, to the process of reconciliation between Rome and Constantinople and to the promotion of interfaith dialog,” said the Dean of the Faculty of Catholic Theology, Professor Franz Xaver Bischof. “By bestowing an honorary doctorate on Bartholomaios I, we express our appreciation of his exemplary dedication to peace, social justice and minority rights, and acknowledge his innovative ecological initiatives for the protection and preservation of all of creation,” the Dean added. Bartholomaios I. was consecrated as Ecumenical Patriarch and Archbishop of Constantinople in 1991. As such, he is the primary spiritual leader of the Orthodox community, which consists of some 300 million members worldwide. Having studied at the Munich Faculty from March 1967 until July 1968, he has retained close contacts with LMU since then. In particular, he has been a strong supporter of the Institute of Orthodox Theology, which forms part of the Faculty of Catholic Theology at LMU.